A few weeks ago, a reader of TSLL commented on this segment shown on KATU in Portland regarding my makeup and skincare and asked a couple of questions about the products I used. While I will not profess to have the knowledge of a beauty expert, I will go so far as to say if we have been tending to our skin since young adulthood, noticing what works, what doesn’t and why, we come to be quite proficient and understanding the worthwhile power in investing in good skincare. One of the most significant ahas I had regarding what skincare worked best and why I had trouble with breakouts as a young adult as well as at various times in my twenties is something I shared in detail in this episode of the podcast (as well as a post), 8 Ways to Create Glowing Skin. 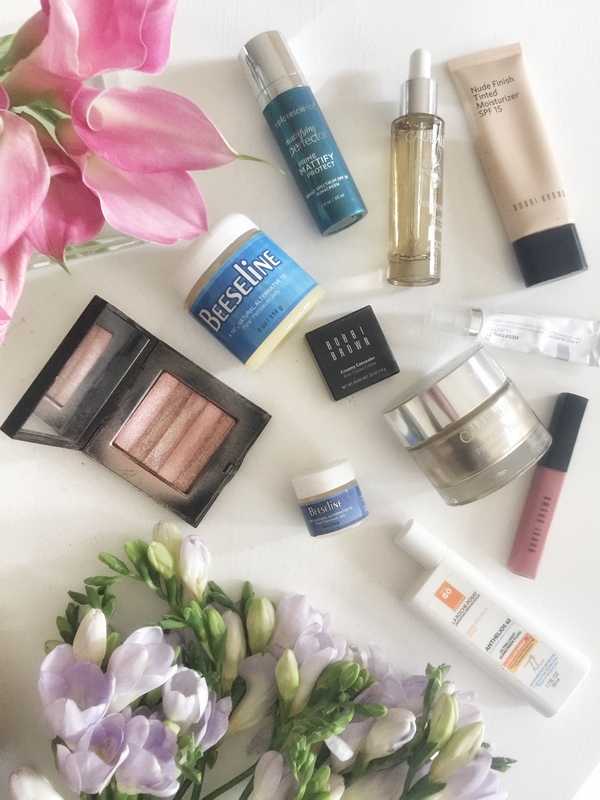 Since that post in 2014, I wrote this post this past spring sharing my 8 Favorite Skincare Products; however, it was brought to my attention by Janis’ question mentioned above that I haven’t put both my daily skincare as well as makeup choices and recommendations in one post. Much like the clothing we wear, the food we eat, the people we bring into our lives, what we put on our skin must be quality if we expect a quality result. As a young woman in my early twenties, I couldn’t afford La Mer, but continually remember hearing and reading about its magic. And while it has admittedly a significant marketing budget, there is a reason it continues to be beloved by customers around the globe – it works. As shared in June’s Ask Shannon episode of the podcast (#161), the best makeup choices any of us can make are to care for our skin. As we grow older in years, it is not inevitable that our face will appear similar to those who came before us who didn’t perhaps have the knowledge of how to take care of their skin. Our visages become a book full of our journeys, what we consume, how we live our lives and our attitudes about life. Upon recognizing the power of good skincare, assuredly, you will spend more money on serums, moisturizers and masques, but I have a feeling, if you’re like me, you’ll spend less money on actual make-up and begin to see a younger, healthier you looking back at you in the mirror. Below is a list of what I use on a daily basis. I have combination skin and live in a high desert climate (extremely dry). I have been prone to breakouts in my T-zone all of my life; however, when I adhere to the proper regimen (listed below), it is rare to have even one pimple each month even during times of elevated progesterone during my menstruation cycle. To view other products I use, love and recommend that are bi-weekly, weekly or used less often, check out TSLL Beauty Shop. ~Note: None of the items listed are sponsored. This is entirely a list of items I use currently and highly recommend. There are affiliate links incorporated into some of the items. ~Caudalie Premier Cru The Elixir: A light facial oil and serum combination firms and smooths the skin. I use one dime size amount and massage it onto my entire face, décolletage and entire neck (front and back). OR Rodin olio lusso Jasmine & Neroli Face Oil: Living in an extremely dry climate I have gravitated toward using Rodin’s facial oil as it is more deeply moisturizing but still clean. My skin glows every time. While expensive, if my budget doesn’t allow for this purchase, I defer to Caudalie’s Elixir (above) which is half the price and still quite wonderful. ~Caudalie Premier Cru La Crème Riche: A deep facial moisturizer. I have gone back and forth between this jar and La Mer’s Crème de la Mer. I sought out Caudalie’s La Crème Riche as it came highly recommended and the price per ounce was far cheaper. Currently, I am using Caudalie’s and I couldn’t be happier as the difference is very slight. I purchased from Amazon and saved even more money. ~La Roche Posey’s Anthelios 60 spf Face Sunscreen (ultra-light fluid): Every single morning, I add this sunscreen to my face and chest. It is weightless and effective. Consumer Reports recently placed La Roche Posey on the list of one of the most highly effective and trusted sunscreens. For the past four years or so I have been using it without disappointment. ~Eminence Lavender Age Corrective Night Eye Cream: A light eye-cream I place around the entirety of my eye. I shared more about my love for the Eminence organic skincare brand here. ~Colorscience Primer: The first layer of make-up I put on my skin is a primer as it smooths out any redness and feels like silk on the skin. It also enables me to only use tinted moisturizer rather than foundation. Learn more about the products and how each item works with your and for your skin here. ~Bobbi Brown’s Sheer Finish Pressed Powder in Pale Yellow: I brush it lightly on top of my concealer under my eyes. ~Cetaphil: a gentle cleanser with warm water to remove the day’s grit, sweat and dust. ~(same as AM) Caudalie Premier Cru The Elixir: A light facial oil and serum combination which firms and smooths the skin. I use one dime size amount and massage it onto my entire face, décolletage and entire neck (front and back). OR (same as AM) Rodin olio lusso Jasmine & Neroli Face Oil: Living in an extremely dry climate I have gravitated toward using Rodin’s facial oil as it is more deeply moisturizing but still clean. My skin glows every time. While expensive, if my budget doesn’t allow for this purchase, I defer to Caudalie’s Elixir (above) which is half the price and still quite wonderful. ~(same as AM) Caudalie Premier Cru La Crème Riche: A deep facial moisturizer. I have gone back and forth between this jar and La Mer’s Crème de la Mer. I sought out Caudalie’s La Crème Riche as it came highly recommended and the price per ounce was far cheaper. Currently, I am using Caudalie’s and I couldn’t be happier as the difference is very slight. I purchased from Amazon and saved even more money. ~La Roche Posay Redermic R Eyes Anti-Aging Retinol Eye Cream: Again La Roche Posay is a brand I trust, and upon beginning to use their eye cream (they have a few different options) in March I noticed an improvement in the firmness of the skin around my eyes. ~Beeseline: An all-natural, organic alternative to Vaseline. I love Beeseline throughout the day to moisturize my lips and especially before I go to bed. Hydrate all day: Drink water from the moment you wake up (have a glass next to your bed), throughout the day, make it your drink of choice and one large glass before falling asleep. Limit your alcohol: While I will always want to enjoy a glass of wine with a delicious meal as the flavors of both are enhanced, keeping alcohol consumption low reduces dehydration of your skin. Eat well: Check out this post which dives deep into how to feed your body well which is reflected in your skin. Reduce or eliminate unnecessary stress: Any time my skin has broken out, even if I am adhering to my above regimen, it is because of heightened stress in my life. Read this post to discover how to reduce unnecessary stress. Consistent moderate exercise: Find something you love, make a date with yourself, a friend, your pets to partake five days a week and make it your ritual. The added bonus of curating a skin regimen you love and you know works is the way it feels to pamper you skin. I look forward at the end of the day, adding my moisturizer and feeling my skin immediately get a boost of life after a long day at work or outside. While I know not all or maybe only a few of my recommendations will work for you based on what your skin and lifestyle need, it is with full confidence that I share this list with you today. Having sensitive skin, the process has been a journey, and I am just ecstatic to have found products I love and ones that love my skin. If you have any questions, feel free to leave a comment and I will do my best to answer. Hello Shannon I so agree with this post. I have looked after my skin since being a teenager. I cleanse and moisturise every day and exfoliate twice per week. I do likewise for my body, using body lotion after every bath. I would also recommend body brushing before the shower and definitely notice a difference. My makeup bag is half the size of most which simplifies life. Best wishes from the UK. Thank you for sharing your experience. Yes, I as well brush before showering. Such a simple practice and feels amazing! A list of all recommended beauty practices is shared in a very early post titled Beauty Routines (and also in the 1st book’s Health & Beauty chapter). Shannon – I noticed what gorgeous skin you have on one of your last tv segments and your make-up was perfection! Nice post! Hi Shannon, I was so grateful and thrilled to find this comprehensive answer to my question today! That Bobbie Brown lipgloss is going on top of my list for Fall purchases. Reading your fall lists and posts have truly helped ease the sting of leaving the summer behind. I hope you are having a wonderful start to the school year! Thank you for the idea. 🙂 Have a wonderful beginning to fall as well. Thank you for the comprehensive regimen Shannon 😉 More to explore as I fine tune my routine. Just curious, what do you remove your face and eye makeup/mascara with? I use Cetaphil in the evening and Beeseline for my eye make-up and then a cotton ball. I used to use special eye make up remover from Neutrogena (and still would recommend it) but Beeseline works great and saves me money.